Be the first to share your favorite memory, photo or story of Tillie. This memorial page is dedicated for family, friends and future generations to celebrate the life of their loved one. Tillie Lou Noe Smith, 87, passed away November 6, 2018 in Delray Beach, Florida. Mrs. Smith was formerly a resident of Oak Ridge, Tennessee and member of St. Mary’s Catholic Church. Mrs. Smith was a Registered Nurse. Born in Alcoa, Tennessee on June 20, 1931, she was the wife of the late John Joseph Smith, Sr and the daughter of the late Harvey and Calma Noe. 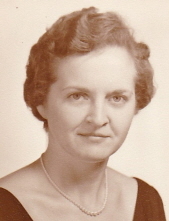 She is survived by five children; John Smith, Jr. and his wife, Maggie, Mary Smith and her husband, Brent Cahoon, Margaret Hollandsworth and her husband, Rob, Elizabeth Smith and her husband, Robert Harris, and Edward Smith and his wife, Estella; eight grandchildren, Robert III, John, and Jenna Hollandsworth, Maxwell and Drake Harris, and Haley, Katherine, and Sean Smith; and by many nieces, nephews, grandnieces and grandnephews. She was preceded in death by her sisters, Calma Noe Simcox and Susan Noe Galyon. The family will receive friends on Monday, November 12, 2018 from 9 - 10am at St. Mary's Catholic Church. The funeral will begin at 10 a.m. and the burial will follow immediately at Anderson Memorial Gardens, Oliver Springs Highway, Clinton. In lieu of flowers, the family has requested that memorial donations can be made to your charity of choice. An on-line guest book can be signed at www.weatherfordmortuary.com. To send flowers or a remembrance gift to the family of Tillie Noe Smith, please visit our Tribute Store. "Email Address" would like to share the life celebration of Tillie Noe Smith. Click on the "link" to go to share a favorite memory or leave a condolence message for the family.